Choosing the Correct Tape for Your Box - Leaman Container, Inc.
Packaging tapes consist of a backing material known as the “carrier” and a layer of adhesive attached to one side. Differing carriers and adhesives are combined to meet the needs of a variety of applications. In the packaging industry, polypropylene is the most popular carrier. Acrylic and hot melt are the most common adhesives. 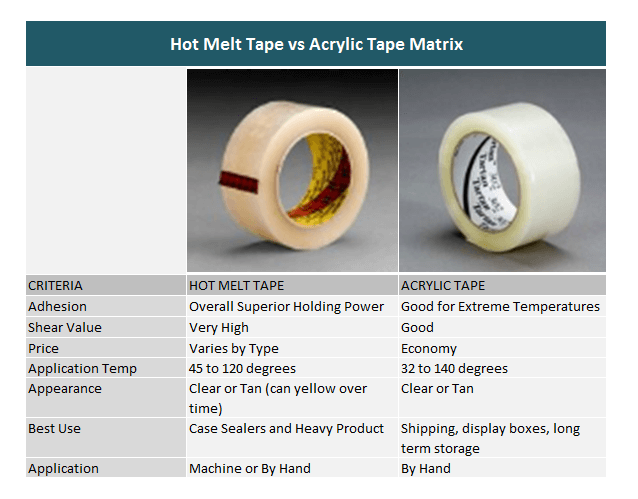 Wider temperature range (able to be used in freezing or in hot temps) – Acrylic tape has a service temperature of -10F to 200F vs. -10F to 140F for hot melt. Longer shelf life – Acrylic can retain its initial performance for several years. Pricing Advantage – At the time of this study, the price of acrylic was less expensive when compared to equal thickness hot melt tape. Great quick initial tack – Hot melt’s quick tack property helps it adhere to dirty, dusty, and soiled substrates or plastics. High Sheer – Hot Melt has greater sheer to allow for better use on rigid corrugated boxes as well as over-stuffed/under-filled boxes. 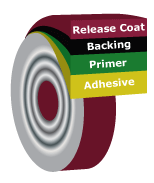 Consistent & Easy Release – The release coat used on hot melt allows for the tape to dispense with a consistent release through the entire tape length. Acrylic tape is harder to unwind from the roll so it is stronger tape. The opposite is true. Hot Melt adhesives are so much stronger that they require special releasing agents on the back of the tape, so they can be pulled off the roll. This is why Hot Melt tape works better in case sealers. Acrylics can be over-stretched in a Case Sealer which may cause them to come off when they are applied. All acrylics are the same. Some acrylic adhesives are made in small batch reactors. This causes variation from batch to batch which means inconsistencies in the tape. Also, there are a wide variety of adhesives that are used for different applications like cold temperature environments or boxes that may be exposed to moisture. A Fiber Pull Test is the best way to tell how well a tape will perform. A Fiber Pull test can show skewed results if you pull the tape off of box prematurely. The reason Hot Melt adhesives work well is because they flow deep in the fibers of the box which takes a few minutes. The tape will stick immediately, but it will reach its full potential after a few minutes. The tape should be a minimum of 2” wide. Tape thickness is typically measured in MIL. 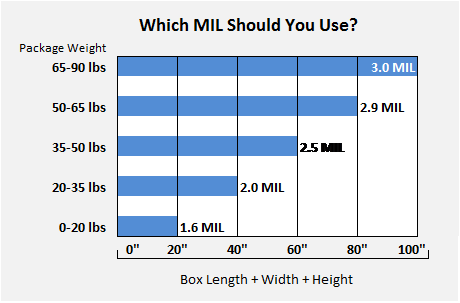 Whether using Hot Melt or Acrylic tape, the below guidelines will help with choosing the correct MIL thickness of the tape based on your box dimensions and weight. The above chart is a basic overview, but factors like box overfill, box coatings, and handling may require a more detailed analysis of your MIL needs. Note: Be sure the end of the tape goes at least 2” over the end of the box to ensure maximum adhesion at the tape ends. Thickness – Distance from one surface of a tape, backing or adhesive to the other. Typically, expressed in mils or thousandths of an inch. This is usually measured under slight pressure with a special gauge. 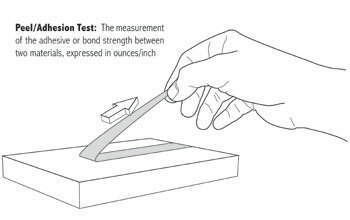 Tensile Strength (break strength) – Tensile strength is the measure of force required to break a piece of tape by pulling on opposite ends of the piece, and is usually expressed in pounds per inch. Elongation – Elongation is the amount a tape is able to stretch without breaking, and is generally expressed in a percentage. Some tapes have a creped, or somewhat wrinkled, backing that allows the tape to have more stretch and conformability. Peel/Adhesion Test – Peel adhesion is the measurement of the adhesive or bond strength between two materials, and is generally expressed in ounces/inch. Peel adhesion can be tested by pulling the tape perpendicularly to itself. This test supplies necessary information about the bond strength of the adhesive and a substrate, and is usually carried out on stainless steel. Application Temp – The temperature of the work area when the tape is being applied. Operating Temp – The temperature(s) the tape could be exposed to after it is applied (e.g., a tape may be applied in a heated facility where the temp is 70 degrees, however after the packaged is shipped, it may sit in an airplane at 30 degrees or on a dock exposed to the sun at 100 degrees. Water Activated Tape is a less used option that is becoming more popular again as companies are focusing on greener material options. WAT is comprised of a carrier made of paper and a starch based adhesive. In addition, fiberglass can also be imbedded between 2 layers of the carrier to add strength. When evaluating which WAT tape thickness is appropriate for an application, it is important to segregate between fiber and non-fiber reinforced WAT. Fibers reinforcement not only strengthens the tape, but also mitigates tearing. This is specifically important when shipping cartons (e.g. 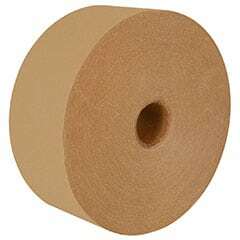 shipping with UPS or FedEx) where a fiber reinforced WAT should be utilized to limit tearing. The below chart is a basic guide for selecting the correct WAT tape based on your pack weight and unitization. When looking for a green alternative to poly tapes, water activated tape is a good option and in most applications it can perform to the standards required by the packaging and transportation processes it will be exposed to. Something as simple as tape has many hidden characteristics which must be considered when choosing the correct tape for your operation. Choosing the wrong tape can not only hinder the presentation and performance of your product’s packaging, but also reduce the efficiency of your operation or increase your material costs. Be sure to discuss all of your business needs with your Leaman Container representative when choosing the correct tape for your company. At Leaman Container, extraordinary competence is a core value.